Why is the RBI so pessimistic? As expected, the Reserve Bank of India (RBI) kept interest rates unchanged on Monday. Recent external developments were a key influence, tying the central bank’s hands even as growth is in the abyss. What defies reason, however, is the RBI’s inflation guidance, which states: “It is only a durable receding of inflation that will open up the space for monetary policy to continue to address risks to growth." This statement departs significantly from the guidance it gave on 3 May, raising the spectre of no further easing, at least in July. Why this pessimism? In its May annual review, RBI had projected wholesale price index (WPI) inflation to be range-bound around 5.5%, the risk factors being sectoral demand-supply imbalances, correction in administered prices, farm support price increases and the current account; these, said RBI then, “…yields little space for further monetary easing". 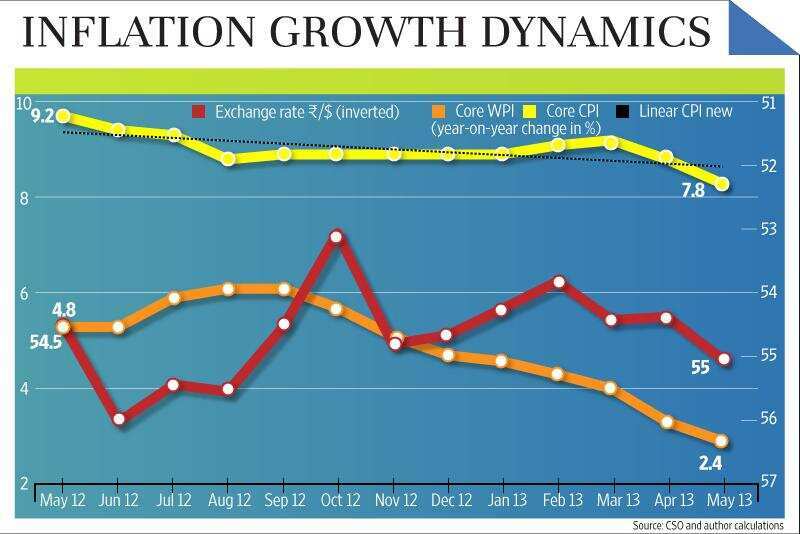 Four data points illuminate the inflation-growth dynamics since: WPI inflation in May was lower at 4.7% year-on-year (from 4.9% in April) with core-WPI at 2.4% (from 2.8%), while retail inflation fell to 9.3% (8.4% in April) and core-consumer price index (CPI) inflation declined to 7.8% from 8.3%. Industrial production grew 2.4% in April (3.4% in March) while GDP grew 4.8% in January-March. The Indian central bank simply fails to acknowledge the positive price developments in its guidance, expanded now to food inflation persistence, while its inflation projections remain unchanged. Likely, the concern is the elevated CPI level, which RBI fears could get a fillip from resurgent WPI inflation thanks to the rupee’s recent fall. Such extreme caution seems unwarranted in the light of past trends, viz., the sharp June 2012 depreciation and the muted pass-through thereafter (chart) owing to weak demand and lower oil and commodity prices, factors that endure at this point too. If only shows, demand is weaker and inflation significantly lower, limiting the inflationary impact of depreciation. The increasing weightage to CPI that RBI is now beginning to accord owes, not in the least, to the fact that past monetary policy errors have contributed to the current external sector havoc: negative real interest rates pushed savers to gold, while a stop to reserves’ accretion has left the RBI one lesser tool for juggling growth-inflation-current account tradeoffs. As comparison, over November 2009 to June 2010, CPI inflation ranged from 13-16%, WPI inflation zoomed from 4.5% to 10.6% and GDP growth exceeded 9%, while policy rates moved from 4.75% to 6.25%! The RBI’s sage advice, “the key to reinvigorating growth is accelerating investment by creating a conducive environment for private investment, improving project clearance…leveraging on the crowding-in role of public investment", disregards the nascent emergence of supply-side positives (e.g. rise in domestic coal production, timely onset of monsoons, resumption of roads and some other projects); weak but stable switch from public to private business spending and the results of its own corporate survey showing a fall in the interest coverage ratio in December 2012 quarter, which would only have worsened since. It seems reviving growth is now solely the job of the government.